Die besonders schutzbedürftigen Verbraucher nach der UWG-Novelle 2015. 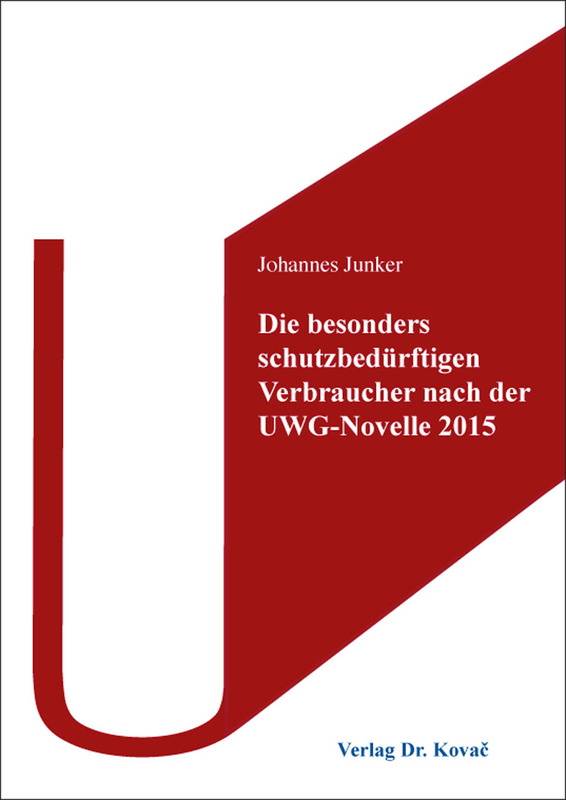 Dissertation (english) von Johannes Junker, Verlag Dr. Kovač 2019, 254 S.
Since the creation of German UWG in 1909, the need for a special protection of certain consumers who may be particularly vulnerable to commercial practices, is generally acknowledged in professional literature and legal practice. This special protection exceeds the general consumer protection which competition law provides. A classic example for such particularly vulnerable consumers would be children and adolescents. But a special protection can also be considered on an individual basis in the case of consumers who suffer from physical or mental deficits, regardless of whether these deficits originate from age or illness. With the amendment of the UWG in 2004 this special protection was codified for the first time, whereas the Unfair Commercial Practices Directive of 2005 used the term “particularly vulnerable consumers” for the first time. In the aftermath of this new legislation professional literature and legal practice applied continuously more generous standards towards advertisers, which also reflected the new European concept of consumer benchmarks. After the European Commission had expressed its concerns over an insufficient implementation of the UCP Directive through the UWG amendment of 2008, the German legislator felt obliged to once again amend the UWG in 2015. As a result, the special protection for particularly vulnerable consumers now is stipulated in two different paragraphs, § 3 Abs. 4 S. 2 UWG and § 4a Abs. 2 S. 2 UWG, whereas before it was essentially established in § 4 Nr. 2 UWG 2008. Consequently, the dissertation on the one hand deals with the dogmatically interesting question of how the relationship between § 3 Abs. 4 S. 2 UWG and § 4a Abs. 2 S. 2 UWG is to be assessed. In this context, the author also analyses a possible incompatibility of § 4a Abs. 2 S. 2 UWG with the UCP Directive. On the other hand, the dissertation answers the question, whether the UWG amendment of 2015 led to a reduction of protection standards in the field of particularly vulnerable consumers, as was partly suspected by consumer organisations.